inscription: Lower right edge has: "Photo by Lou DeMatteis Design by Cecilia Brunazzi". Poster has a gray background overall. Top edge has a small black rectangle with the text: "Comedy Troupe". Center of poster has a black and pink photograph of four men and two women standing in a line, smiling, and looking at the camera. 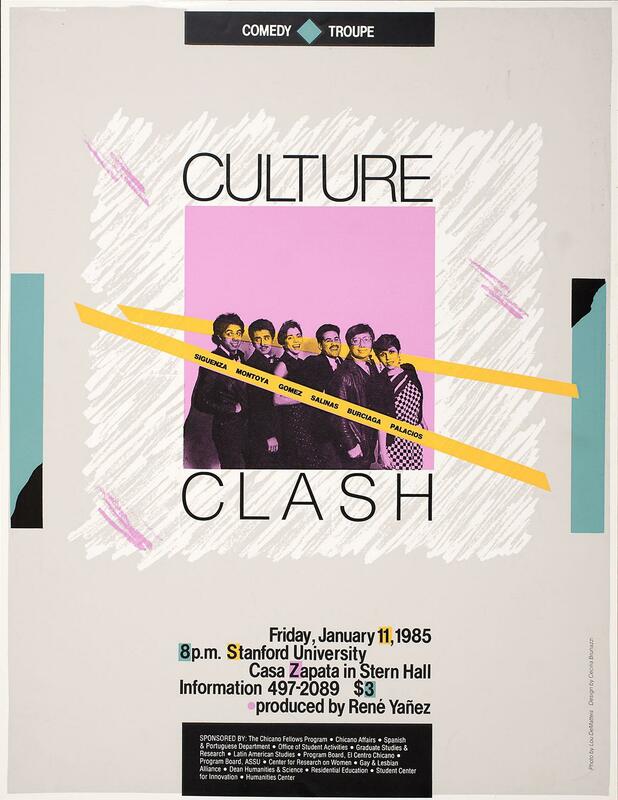 Above the top edge of the photo is the text: "Culture" and below the bottom edge: "Clash". There are two orange lines that cross the photo horizontally, one is translucent and crosses the faces of the people in the photograph. The other orange line is below the first and has the text: "Siguenza Montoya Gomez Salinas Burciaga Palacios". The center of the poster also has a background of stylized brushstrokes in white with three pink accents. The left and right edges each have a small turquoise rectangle that is black at one end. 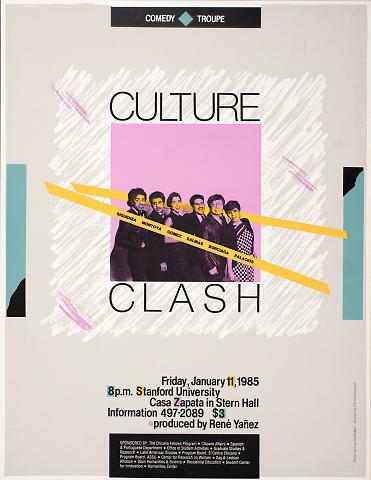 The bottom of the poster has the text: "Friday, January 11, 1985 / 8 p.m. Stanford University / Casa Zapata in Stern Hall / Information 497-2089 $3 / produced by René Yañez". Bottom edge has a small black rectangle that contains the text: "Sponsored By: The Chicano Fellows Program - Chicano Affairs - Spanish / & Portuguese Department - Office of Student Activities - Graduate Studies & / Research - Latin American Studies - Program Board, El Centro Chicano - / Program Board, ASSU - Center for Research on Women - Gay & Lesbian / Alliance - Dean Humanities & Science - Residential Education - Student Center / for Innovation - Humanities Center".